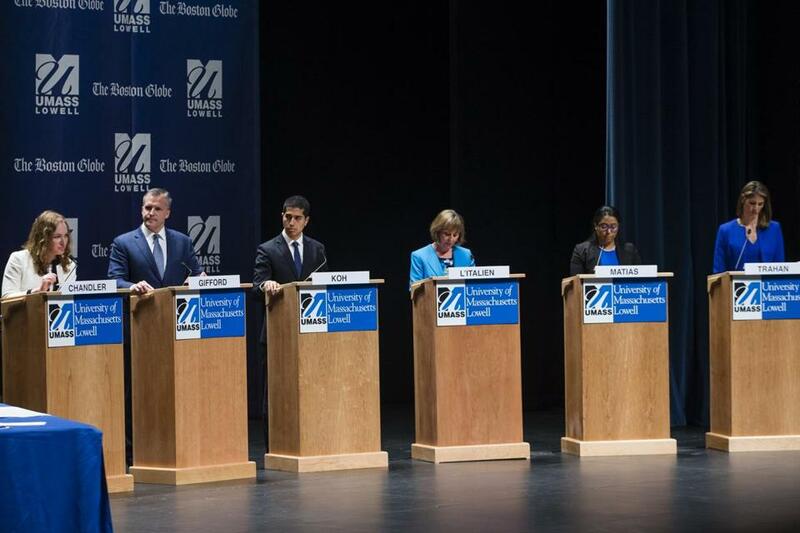 Democratic candidates Alexandra Chandler, left, Rufus Gifford, Daniel Koh, Barbara L&apos;Italien,Juana Matias, and Lori Trahan participate in a debate for the third district congressional seat in Lowell. LOWELL — Crowding onto a UMass Lowell stage Sunday, 12 of the Democrats running in the Third Congressional District appeared to agree on almost everything. That includes, it seems, keeping things cordial — for now, at least. Offered a chance to differentiate themselves from the bulging field, candidates vying for the open seat presented a united front during a pair of debates sponsored by The Boston Globe and the University of Massachusetts Lowell, railing against President Trump, calling for a pathway to citizenship for undocumented immigrants, and vowing to fight the tax law passed last year by the Republican-controlled Congress. It wasn’t until the second debate’s final moments, however, did a bloodless policy battle show signs of a brewing fight. Lori Trahan, a Westford resident and former chief of staff to former Representative Martin T. Meehan, targeted the five other Democrats on stage, and to a specific degree, Dan Koh, the Andover native and former chief of staff to Mayor Martin J. Walsh of Boston, who moved back to his hometown as part of his campaign. “Many of the people I’m standing alongside — in fact, all of the people I’m standing with — have funded their campaign primarily from special interests, whether it’s from Boston City Hall or from Beacon Hill,” Trahan said in a sometimes halting delivery. The comment did not go unnoticed. As Trahan spoke, fellow candidate and state Representative Juana Matias whipped her head to look at Koh, standing to her right. Next to him stood Rufus Gifford, a former US ambassador to Denmark who, too, moved to Concord as part of his campaign. Offered a chance to respond directly on stage, Koh smiled and declined, saying the candidates had already “taken too much” of the audience’s time Sunday. Afterward, he said he was content to let the comment lie. “Honestly, the thinking was it was the end of a long debate. We weren’t going to stretch it out and end it with negativity, in my mind,” Koh told reporters. The back-to-back debates — with the second drawing roughly 600 attendees — provided one of the first major stages for the candidates to directly face off as they vie for the nomination to replace Representative Niki Tsongas, who announced in August that she would not seek re-election. The candidates were split between two panels based on the results of a recent Boston Globe/UMass Lowell poll, where Gifford held a slim lead over the crowded field with 11 percent. He was joined on stage by Alexandra Chandler, a former intelligence analyst from Haverhill; Koh, of Andover; state Senator Barbara L’Italien, of Andover; Matias, of Lawrence; and Trahan, of Westford. Proceeding them was a six-person debate that drew about half as many attendees and featured Beej Das, a businessman of Lowell; Jeff Ballinger, an Andover labor organizer; Leonard Golder, a Stow attorney; Patrick Littlefield, a former Veterans Affairs executive from Boxborough; Bopha Malone, a bank vice president of Bedford; and Keith St. John, a Marlborough entrepreneur. All the candidates face a wide-open race. A vast majority of voters in a Globe/UMass Lowell poll — 58 percent — were undecided on whom they would support. Each candidate argues that they can bring voters a different perspective. Das and Littlefield had criticized the decision to use the poll results to separate the candidates into two groups for the debates, arguing it should have been done at random. One candidate, Don Bradley, did not respond to requests to participate, according to UMass Lowell officials. All the candidates face a wide-open race. A vast majority of voters in the Globe/UMass Lowell poll — 58 percent — were undecided on whom they would support. The candidates acknowledge that their stands on policy issues are very close, but they each argue they can deliver voters a different perspective and have emphasized their different connections to the sprawling district. They introduced themselves to an audience Sunday that appeared to be dominated by groups of their respective — and vocal — supporters, at Durgin Hall. Asked specific questions, they largely fell on the same side. Nearly all six in the second debate gave Governor Charlie Baker poor marks, giving him a D or C letter grade. Trahan gave the Republican a B, praising Baker’s work on opioids. The Globe/UMass Lowell poll showed 80 percent of the likely Democratic primary voters in the district voicing approval for the governor’s job performance. Three candidates — Chandler, Gifford, and Koh — also said they would pick the House’s minority leader, Nancy Pelosi, to be the next House speaker; L’Italien, Matias, and Trahan didn’t commit to anyone in particular. The opener, too, was largely civil. Das, Ballinger, and Malone all said if elected they’d actively pursue impeachment proceedings of Trump. Ballinger and St. John said if they had to choose, they’d back US Representative Seth Moulton as the Democrats’ 2020 presidential nominee. Only Das took out his metaphorical knives, albeit in brief instances not directed at anyone sharing the stage. Asked about the Trump administration’s posturing on international trade, Das called the North America Free Trade Agreement a “mistake,” and placed blame on the district’s former representative, Meehan, for supporting it. And when a question turned to transportation, Das touted his place on a working group pushing a North-South rail link in Boston — and criticized Trahan and Koh, who he said had joined the group but hadn’t been to its small number of meetings in recent months. Trahan and Koh acknowledge they haven’t attended but that they support the idea of connecting Boston’s two train stations. The winner of the primary will face Rick Green, a Pepperell businessman and the lone Republican running, in the Nov. 6 general election. In a statement Sunday, Green criticized the Democrats for trying to appeal mostly to their own party. “What stood out for me is that they applauded Nancy Pelosi but criticized Charlie Baker, who is a model of bipartisanship,” said Green.